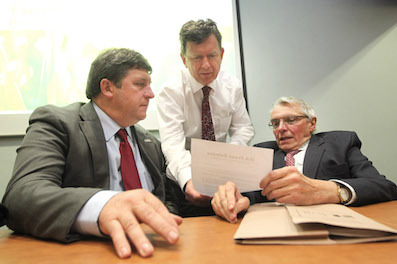 Acting IFA President Tim O'Leary with acting General Secretary Bryan Barry, and Economist Con Lucey at the IFA Executive Council Meeting at the farm Centre in Dublin. Some 300 farmers attended the Meath IFA county executive meeting on Monday night in Navan with a consensus that the Executive Board of the IFA stay in situ until an election and then put themselves forward for re-election. County Chairman Diarmuid Lally said he outlined the position and happenings of the past fortnight to the meeting. He said that some local branches had met in the past week and had put forward motions for the IFA Executive Board to step down. “The feeling in the meeting was now is not the time for an election. It would be much better if there was an election in three to six month’s time, if the rules allow it. “The consensus was that the Executive Board as is should put themselves forward for re-election at the same time as the presidential election or step down then. Lally also said that the only other preface was when Con Lucey’s report is made available, that the county executive could then revisit the situation if necessary. Meanwhile, Clare county executive met last night (Tuesday) in Ennis and also decided that waiting until Con Lucey’s report is back is the wisest step. County Chairman Andrew Dundas said close to 200 people attended the meeting, with the acting President Tim O’Leary in attendance. “Tim O’Leary was invited to attend and a lot of people appreciated that he was there. However, he said the meeting decided that the best option was to let the Executive Board sit until December 15 and take it from there.